Whether you crave meaty ribs, grilled fish or a two-fisted sandwich, Jack Stack is your place. 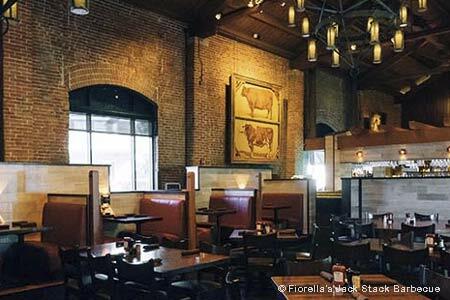 : The Jack Fiorella barbecue clan's third restaurant in the metro area is by far the most handsome of the locations, with exposed bricks and beams, a stone floor and an inviting bar for relaxing. And the barbecue just can't be beat. Whether you're craving meaty ribs or a two-fisted sandwich, Jack Stack is your place. The onion rings are thick and sweet and served on a copper skewer. The crown Prime short ribs of beef? They deliver three to four pounds of first-rate meat. That said, the Poor Russ is one of the best barbecue sandwiches in town. Be sure to try the beans, too, which are generously enhanced with meaty goodness. For the non-barbecue fan, Jack Stack serves some terrific fresh fish, prepared in the barbecue oven along with the meats.